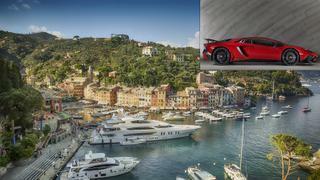 Starting the escapades on the Italian Riviera, anchor outside the Portofino Harbour, which is one of the most iconic Italian moorings and can host yachts over 70 metres, and tender to shore to meet your first supercar of the trip, the Lamborghini Aventador SV. Sporty and stylish with a top speed of 217 mph and the ability to go from 0–60 in 2.7 seconds, you’ll be sure to turn heads in streets of Portofino. Enjoy a lunch overlooking the bay at Hotel Splendido and head to Ristorante Puny for a supper of its critically acclaimed pappardelle Portofino, the chef’s signature dish featuring thick ribbons of fresh pasta in a creamy basil and tomato sauce, before relaxing next to the harbour and watching the sunset from Winterose Portofino wine bar. Speed off towards Monaco via the stunning coastal roads along the way. There are some great winding roads and tight tunnels —you’ll really hear the V8 engine. If you’re making the trip during April, make a stop in Sanremo for the Rally Storico, the small city’s famous car rally event for cars made between 1931 and 1981. Arrive in glittering Monaco to meet your next vehicle, the Ferrari 488 Spyder. 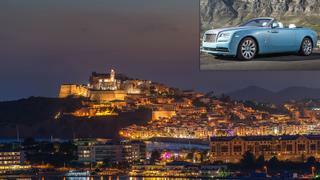 Smooth, stylish and powerful, it can accelerate to 124mph in 8.7 seconds and is a great example of Ferrari’s advanced technology, making it the perfect ride for a hedonistic stint in the principality. 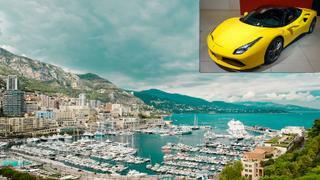 Monaco is the home of supercars and what better way to enjoy a Ferrari than cruise around Monaco taking in some of the roads from the famous Monaco F1 Grand Prix. Head to Monaco BeefBar for an incredible steak at one of the best restaurants in Monaco on your first night – while the Japanese Kobe beef is second to none, try the Rangers Valley, featuring Australian Black Angus beef that has been aged for two years, the center cut Rib-Eye cuts offers a buttery richness that you won’t forget in a hurry. After an indulgent framboise dessert, featuring fresh berries, white chocolate and sorbet, meet your superyacht in Port Hercule. This glamourous marina can berth vessels up to 300 metres and hosts some of the most star-studded celebrities, making it the perfect spot to enjoy a nightcap out on deck. 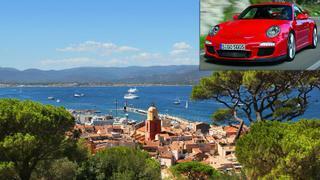 Cruise along the seafront to St. Tropez to meet the sporty Porsche 911 GT3RS, which has of 80% of the downforce of a GT3 Cup racing car. Fast, powerful and with astonishing turn-in grip, it’s ideal for enjoying those winding coastal roads. Before hitting the road west from St Tropez along the Mediterranean coast to Barcelona, spend a couple of days relaxing in the beach bars of St Tropez. Book yourself in for a ‘Dream Day’ at La Reserve Ramatuelle, which includes personalised baineotherapy and body scrub, a full body massage and lunch at Le Voile restaurant, before hitting the beach clubs Club 55 and Bagatelle for an evening of cocktails and dancing. Spend the night on board in the Port de Saint-Tropez, which can host yachts up to 80 metres. St. Tropez to Barcelona is the longest leg of the trip, but will give you ample time to test out this speedy Porsche through the winding, scenic roads of Spain. Once you get to Barcelona we recommend some drinks on the beach at Carpe Diem Lounge and handcrafted, perfectly prepared cuisine at Alkimia. Go for the elements-inspired Jordi Vilà menu, which features langoustine, prawn and fish tartar with caviar and a rich dish of pigeon with mountain romesco and fig. Explore the city with the McLaren 675LT, which boasts some impressive performance figures – 0-62mph in 2.9 seconds and 0-124mph in 7.9 seconds – that would be best tested out in F1 surroundings. 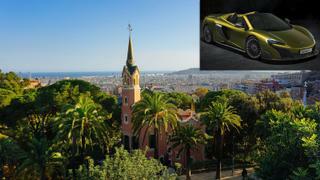 Take it for a few private laps on the Circuit de Barcelona to really push this mind-blowing car to its limits. After a few sundowners back on board your superyacht, moored in the massive OneOcean Port Vell marina, cruise over to Ibiza for another day of adrenaline-pumping pursuits. What better way to end the trip than to party or relax in Ibiza? 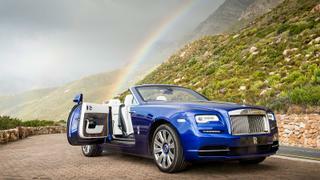 The open top Rolls Royce is the perfect car to cruise around the island taking in the sun and scenery. Created to make its driver look like a rock star, this open-top classically-styled beauty is sure to turn heads around the island. During your stay, don’t miss the recently opened Nobu Hotel, where you can enjoy a fabulous Japanese fusion lunch at Nobu or Balearic specialties at Chambao. If you’ve slightly over-indulged in the last few days, head to the spa for a cooling 30-minute massage, aptly name ‘The Next Day Recovery & Restore’. On your last evening, head to Sublimotion Ibiza for a contemporary twist on food and either Ushaia open-air club or Blue Marlin for a signature Bésame Mucho cocktail of Grey Goose vodka, Aperol, anise and strawberry syrup, peach, lime and Mumm Champagne. Finish your whirlwind adventure back on board in the Sovren Ibiza marina for luxury yachts up to 185 metres, or spend a few days exploring the Balearics on a superyacht.